TUSCALOOSA, Ala. — After getting the week off for spring break, Alabama football is back at the spring practice grind. The Crimson Tide is set to practice 15 times, culminating with the A-Day spring game on April 13. As Alabama coach Nick Saban said when the team opened spring drills, Alabama is focused on getting back to that Alabama mentality of being a team opponents don’t want to face. That mystique has slowly worn off in recent years, but was completely wiped away after Clemson throttled Alabama in the national championship in January. Given the amount of turnover Alabama has each season, new guys must step up every year. Here are five “lesser-known” players who could become household names this season. Jared Mayden, now a senior, served as the sixth defensive back in Alabama’s dime package last season. With Deionte Thompson leaving early for the NFL, Mayden makes sense as the choice to replace him. Mayden finished his junior year with 18 tackles, 1 sack and 2 pass breakups while playing in 13 games. Alabama will need more production out of Mayden if he does step into a bigger role. Mayden has range on the back end, he is big (6-0, 200) and physical enough to play the run and he has good cover skills after starting his career as a cornerback. Look for Mayden to step in at safety next to Xavier McKinney in Alabama’s defense. 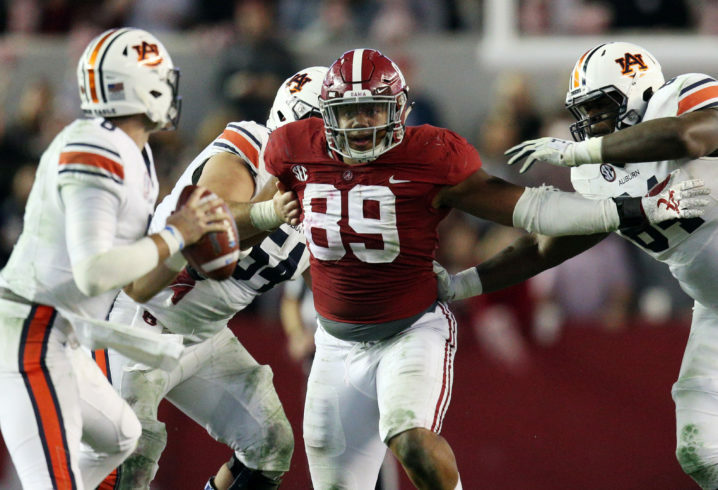 LaBryan Ray, a rising junior, could be Alabama’s next breakout defensive star. Every time Ray (pictured above) got an opportunity last season, he was making a play or around the ball. Ray played in all 15 games as a sophomore, and earned a start against Tennessee where he had a career-high 5 tackles. Ray totaled 39 tackles, 5.5 tackles for loss and 2.5 sacks. He also added two pass breakups and two quarterback hurries in 2018. Ray, a 5-star prospect from Alabama’s 2017 class, is a big-time pass rusher who will be counted on heavily with Quinnen Williams and Isaiah Buggs moving on. A knee injury robbed Chris Allen of his sophomore season, but he should be ready to go this fall. Allen saw time in 7 games as a freshman in 2017, finishing the year with 6 tackles, 1 tackle for loss, 2 hurries and 1 forced fumble. With Christian Miller moving on, Alabama will need players to step up at outside linebacker along with Anfernee Jennings and Terrell Lewis. Allen should be a key player to the 2019 defense as Alabama looks to make a return trip to the College Football Playoff Championship. With Mack Wilson leaving school early for the NFL, Alabama will need someone to step up at inside linebacker next to Dylan Moses. That’s where Joshua McMillon can come in. McMillon, a redshirt senior, has mostly played special teams and mop-up duty, but heading into his final season, this is McMillon’s time to earn a starting spot. McMillon played in 10 games, and racked up 14 tackles, including 1 TFL last season. Alabama doesn’t have a ton of experience at inside linebacker outside of Moses, but McMillon is a veteran who has been around the program for a while. It’s his time now. Two seasons ago, Miller Forristall appeared set to take over as the pass-catching tight end after O.J. Howard left after the 2016 season. But a knee injury 3 games into his sophomore season along with the emergence of Irv Smith Jr. limited Forristall’s opportunities. Now Smith and Hale Hentges are gone, leaving Forristall as the oldest TE on the team. If Forristall has regained that athleticism he showed before the injury, he could be a nice safety blanket for quarterback Tua Tagovailoa this season. He may be a little more known but I hope to see Brian Robinson more this year too. He runs hard and isn’t scared to take a lick. The mystique that was built over 12 years is stripped away in one game? The word you are looking for is hyperbole or ridiculous. They are so bad they will have to start all the down at #2 in next years polls. Bama lost a game and will never win another. It will be interesting to see how Shyheim Carter and Jared Mayden are used this year in the secondary, but I think Daniel Wright could end up at safety. He was impressing last year in the preseason but ended up getting injured and then suspended. If he’s back and no longer in the dog house, then he will likely get a position somewhere in the secondary. Eyabi Anoma and Brian Robinson.